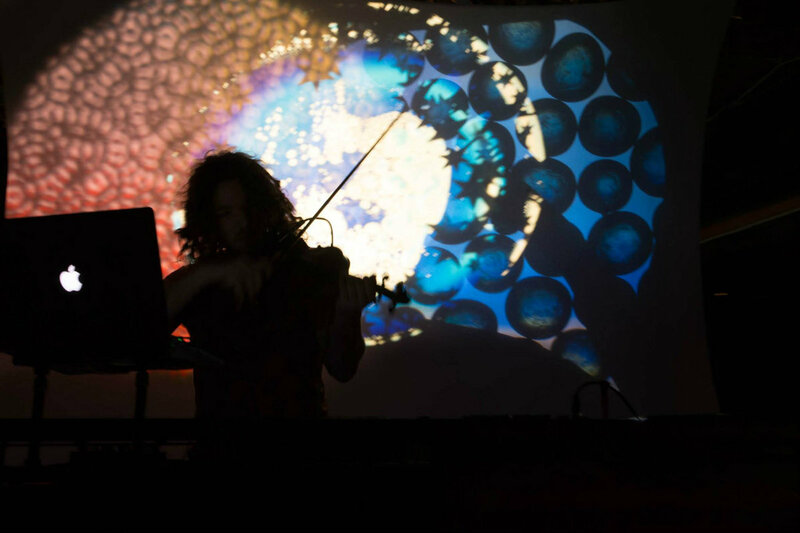 Spectre EP is a three track independent work composed by the Toronto-based electronic music performer, producer and live violinist Totemic. Including a remix by Jonah K's alter-ego "Haunted Drum", Spectre EP builds on Totemic's unique and experimental blend of organic and electronic sounds, live violin and drum & bass arrangement and form. "Breathe" emerges out of a consistent electronic drone, building energy over the course of long sections and minutes with a locked grid of heavy half-time drum patterns, live violin, piano and more. Each section adds new instruments and textures making for a steady, yet controlled increase in energy over the course of the whole tune. Totemic's accentuated use of piano melody is particularly noticeable in the track "Wisp", where this memorable motif continues and evolves for the remainder of the piece. Presented alongside a beautiful arrangement of longing, drawn-out, distant violin bowing, "Wisp" continues to showcase Totemic's patience in songwriting and his ability to build energy over the course of time using all elements and sounds of the spectrum. Haunted Drum's remix of "Wisp" respects Totemic's original sound and style while adding a beefy layer of drums, sharp mid-growls, fresh piano leads and darker piano chords while of course teasing some characteristic sounds that seasoned Haunted Drum/Jonah K/tekno.tribes listeners are sure to recognize.